Well, I didn’t see anything of interest yesterday except road construction taking place in the rain. Most the time the road was just blocked off with no one there. I couldn’t believe when I saw a crew was working in the rain! I did forget to mention that while in Kings Canyon I parked behind a car with a Hawaii license plate, and I recall an Alaska one from Washington. While I didn’t concentrate on the other 48 states or for that matter consciously look for Hawaii and Alaska plates, I believe I can say I succeeded at the license plate game! Today was actually a very interesting day. I was spared the strong winds and rains of yesterday and enjoyed a mostly cloudy sky and a cool breeze while visiting the Petrified Forest National Park. I had expected to make my stop brief as I had already seen petrified wood during my journey. Surprisingly, I ended up staying in the park several hours. When I hear the word forest, I always think of trees standing upward, thus each time I get to a petrified forest that tends to be a barren area with fallen trees of stone, I am automatically slightly disappointed. I keep hoping to see several standing petrified trees. I guess it isn’t easy for silica-laden waters to cover a standing tree for a period long enough to turn it to stone. Regardless, the Petrified Forest National Park was a pleasant surprise in that there were several WHOLE fallen trees that had turned to stone. At most other places, I have only seen a section or a stump. One tree included its trunk and roots. It was known as “Old Faithful”. The colors on all the fallen trees were magnificent: swirls of reds, whites, purples, oranges. In one area called Crystal Forest, trees included crystals with the stones. Also, it seemed like a few trees weren’t completely petrified. I don’t know if that is possible, but the bark was a lighter color and felt more like wood than stone. 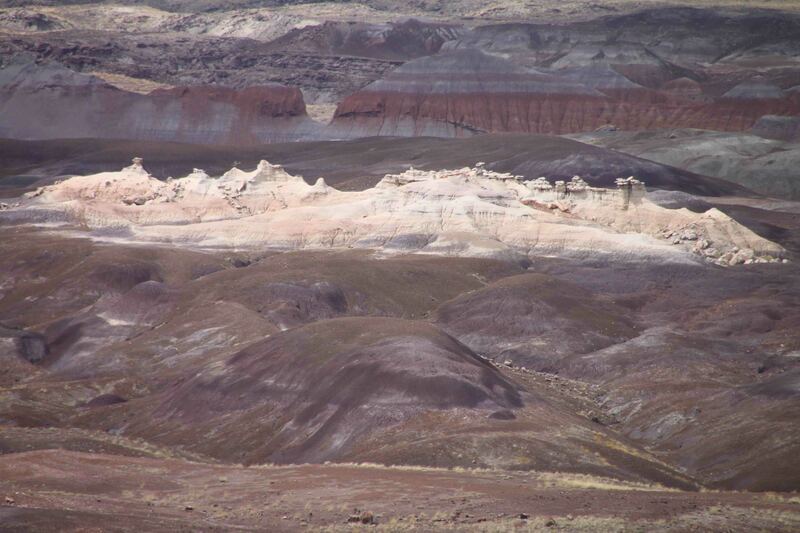 The southern portion of Petrified Forest National Park showcased badlands striped in a various shades of purple, Indian ruins, and petroglyphs. There was even a petrified log bridge as well as an old cabin made of petrified wood. I would have liked to walk through the badlands to the cabin, but 6.8 miles was too long today. While I could have made the time, I would have created long day for myself. Not to mention, I didn’t want to leave Petey in VANilla for endless hours. Newspaper Rock, and Puerco Pueblo we crossed the historic Route 66 to visit the northern section for spectacular views of the Painted Desert. Green valleys contrasted with the orange, pink, salmon, and rust bands of the Painted Desert as the sun and shadows accentuated certain areas of the panoramic vista. The colors were striking. I can only imagine what it would have been like on a slightly clearer day…not too bright, but not as cloudy as today. Wonderful pics. So glad you stopped at the Petrified Forest. We really enjoyed it. I’m glad you’re still writing, as you head home! When you said you were ‘done’ I felt like I was at the end of reading a good book, and left wishing for more.